The US State Department notified Congress September 29 of a potential sale of $815 million worth of GBU-53/B Small Diameter Bombs - Increment II (SDB II) sanctioned by the department to ship to Australia, according to an October 2 news release. According to the Pentagon's arms export branch, the Defense Security Cooperation Agency (DSCA), Canberra requested the bombs. "The proposed sale of SDB II supports and complements the ongoing sale of the F-35A to the Royal Australian Air Force," the agency said. In addition to the munitions themselves, the proposed deal also includes 30 GBU-53/B Guided Test Vehicles, 60 GBU-53/B Captive Carry Reliability Trainers, Weapon Load Crew Trainers, Practical Explosive Ordnance Disposal Trainers, containers, support, transportation, warranties, maintenance, repair and return, and related logistical services. 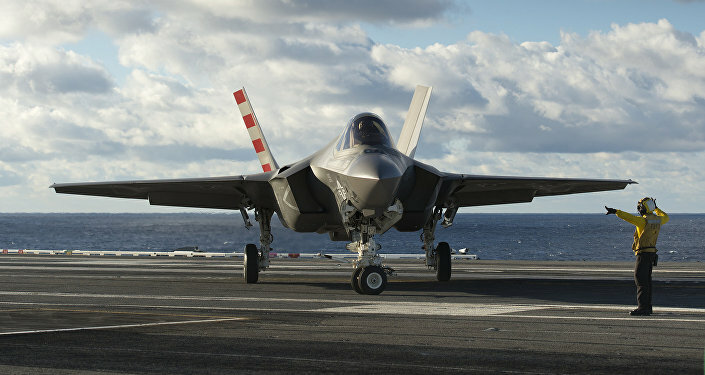 The weapons will "improve Australia's F-35 survivability," enhance the jet's capability "to deter global threats," bolster the island nation and continent's homeland security and perhaps most crucially, allow RAAF to "cooperate in coalition defense initiatives," the announcement states. The bombs are manufactured by contracting giant Raytheon. The firm's stock price ticked up about $0.66 during trading hours Tuesday, an increase of roughly 0.35 percent, according to data from Seeking Alpha. Next, lawmakers have 30 days to allow the deal to go through; promises from the State Department, Defense Department and the White House to sell weapons can be halted by Congress. According to the Defense Security Cooperation Agency, Congress has to pass a bill "expressing its will on the sale" and be able to secure enough votes to beat a potential presidential veto in order to block arms sales. DSCA states in its charter lawmakers remain "free to pass legislation to block or modify an arms sale at any time up to the point of delivery of the items involved." The Australian military is not part of NATO but Australia is considered by the US government a non-NATO major ally (NNMA) in terms of security arrangements. Australia, New Zealand and the US signed a security treaty in 1952 known as the ANZUS Treaty. The GBU-53/B SDB II is a 250-pound bomb that can acquire targets via millimeter-wave radar, infrared homing and semi-active laser tracking. The bomb is designed to track moving targets and can change course mid-flight with updates from the missile's data link package.